With a cat on my lap, a glass of lemon water by my side, and a bag of M-n-M’s in my hand, I settled in at the computer to listen to an hour long MP3 download from Lorrie Flem of Eternal Encouragement Magazine. She had arranged for us Gabby Moms to receive 2 downloads - one about ATTITUDE ADJUSTMENTS, and one about the KEYS TO A QUEENLY CASTLE. I knew, without a doubt, that the one on attitudes would be the best one for me to start with. Not so much because I have a bad attitude. In fact, I always try to think positively, no matter what the situation is. But, I have noticed my “bad-attitude button” has been pushed more often lately, due to the negativity received from my 8-year-old son. 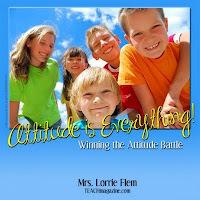 As Lorrie puts it in her talk, “attitude germs are contagious.” So, I have been praying for ways to remedy this problem with “Little Mr. Negative,” and was hopeful to hear some great ideas from Lorrie. You have a “bad-attitude button” that no one can touch, unless you allow them to. You control your attitude, or it controls you. It sets the tone in your entire home. Wake up and CHOOSE to have a positive attitude through-out your day. We don’t have to FEEL good about everything that happens, but we should ACT good. This was all good and well for me to hear, as it was a little refresher course to help keep me pushing towards instilling good attitudes in my children, by using my OWN example. I would surely recommend this download for any mom who needs this kind of encouragement. However, this download left me wanting to know more about how to CHANGE negative attitudes in my children. So, I took a look at Lorrie’s other downloads on this topic and decided to purchase ATTITUDE IS EVERYTHING. This particular download had phone discussions between Lorrie and her audience. To be entirely honest, I did not like the fact that the people asking the questions could not be heard. BUT.... I WAS able to glean some helpful suggestions from Lorrie as she spoke. 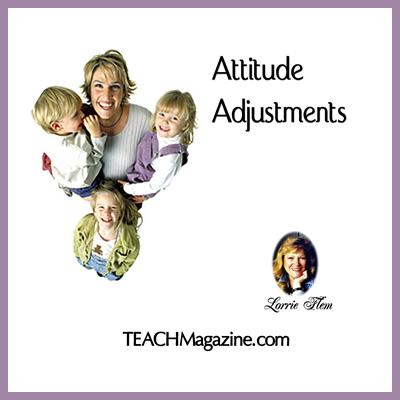 At the beginning, it had a lot of the same information in it that ATTITUDE ADJUSTMENTS has, but then it went more into the topic of OBEDIENCE. Lorrie said you can’t really begin teaching about bad attitudes until you first work on obedience. This is an entirely different subject, so I won’t elaborate on it now. But if you are interested in knowing more about how your childrens’ obedience coincides with their attitudes, then this might be a good session for you to consider listening to. Lorrie gave some helpful ideas on how to teach obedience in this session and, let’s just say, I think we will be making some changes around here very soon! 1. Click HERE to choose the MP3 file you would like to win. The winner will be chosen on Saturday, June 18th via random.org, and will be notified by the e-mail left in the comments. The winner will have 48 hours to respond before an alternate winner is chosen. Good luck, and don't let anyone push that "bad-attitude button" today! Okay? Disclaimer: I received 2 downloads at no charge for a Gabby Moms review. The opinions I have expressed are my own. *sigh* I'm reading this right after my autistic son had a colossal meltdown. And it started with obedience. Hmmm... Thanks for your review! Major amen here...attitude help is always a +! Attitude IS everything, so that sounds like a great audio recording to consider purchasing! Great review! I was wondering about that Attitude is everything Audio. I really impressed with your desire to learn even more. I have a 6 year old with an obedience/attitude issue, so it's good to know what might help. Thanks for your comments, everyone. For those of you who are also having obedience/attitude issues with your kids, I wanted to mention that I have been using the "If-Then" Chart from Doorposts for the past few days to help with this. It helps me to be more consistent, and there is a lot less nagging and raising of my voice. Just something to throw out there, in case you need some ideas to start with. Betsy, I guess you're not a fan of cats, huh? LOL.